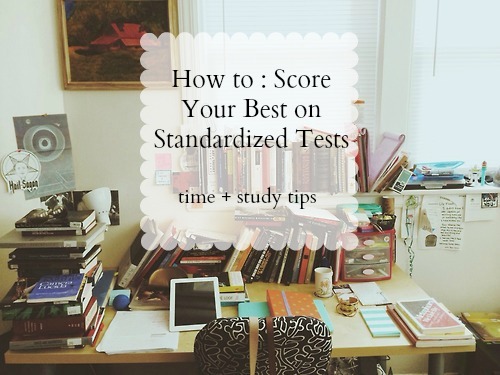 As the end of the school year is approaching, I know that standardized tests are on the horizon for many! My younger sister is a junior in high school and even though the tests are available year-round, most of her friends are taking them at the end of this month or during the summer. With this in mind, I decided to compile my top tips and with the help of my wonderful Facebook friends, I think we've got a solid top 5! 1. Buy the Book Yes, I know, I've doubted them too, but they actually work very well. The specific books for each exam have really good tips as well as explanations for each section. Most of them have at least one practice test, all of which are very helpful. I didn't do the entire book of exercises, but I did go through the quick tips and take 1 or 2 practice exams, which helped me more than anything else. It relieved some of my anxiety about going in without knowing what to expect AND you can score yourself and see what areas you need work in and then flip to that section of the book and work it out! 3. Bring your own supplies I am so glad my teachers pounded this into my head. You'll need three to four PRE-SHARPENED pencils, calculator with batteries, extra batteries, tylenol, a snack (see above), and a watch. By bringing your own things, even if they end up providing them, you can rest assured knowing that you are prepared and don't have to depend on anyone else. And by bringing extra things, you know that if something should go wrong (pencil breaking, calculator dying, etc), you're covered…and trust me, that does A TON for pre-test anxiety. 4. Don't Rush By having your own watch, you can keep track of time yourself. Not having to constantly look up at the clock saves a bit of time, and again, you know you're covered just in case the testing center wouldn't have a clock. Don't get distracted by the people around you that look like they're zooming through…they're probably using my next little tip, but you should only worry about yourself. If you pace yourself and don't spend too much time on one question, you'll be fine. If you don't know the answer skip it and come back. Again, this one was hammered into my head and I'm so glad it was. On most tests, you get partial points for filling them all out so just make sure that even if you run out of time, you still circle something…A and C are the most common answers! Just don't waste valuable time trying to remember a formula when you could be on to the next easy peasy one that will only take a second. You want to hit all of those before coming back to things you may not be able to answer. 5. Try, try again Most standardized tests are offered throughout the year. It is often rumored that there is one easier one per year, so the more you take it, the more likely it will be that you get that one. I will always say that April is the best month because you've just finished reviewing for finals and I've always found that having that refresher right before the test works wonders for me! If you're in the South taking ACT, April is always the most modern readings, so again, I'd say take it then! Don't feel discouraged if your first score isn't as good as you'd hoped. Nobody does their best on their first time and you can always do it again, this time more accustomed to the testing center, the test format, and the timing. That's all I've got at the moment, but if you guys ever have questions, feel free to email me! I'm always up to answer any extra questions you may have as I'm a standardized test loving nerd. What is your "top test tip"? Did these help you? bring your own watch - it's a really good advice! I remember not having one and there wasn't one in the class either, so we'd have to wait for the teacher to tell us the time every 30 minutes. these are all very good advices!